This is a fun recipe my mom made for Easter lunch. She got the idea on Pinterest but had to figure a few things out while trying to make them. 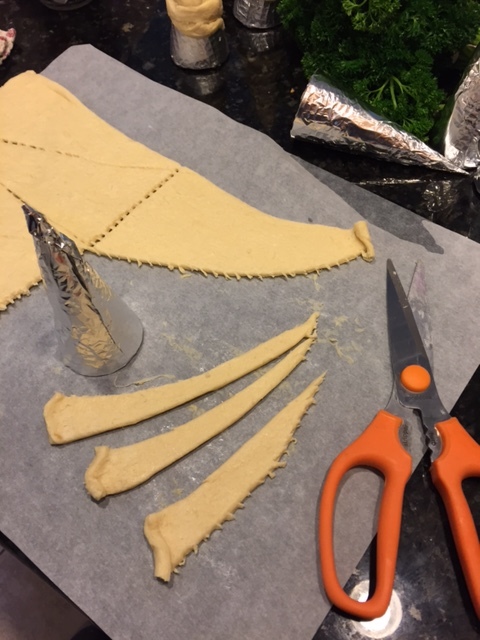 The fun part of this is making crescent rolls into carrot shapes that can then be filled with some kind of salad like egg salad or tuna salad. We made egg salad because, duh, it’s Easter! 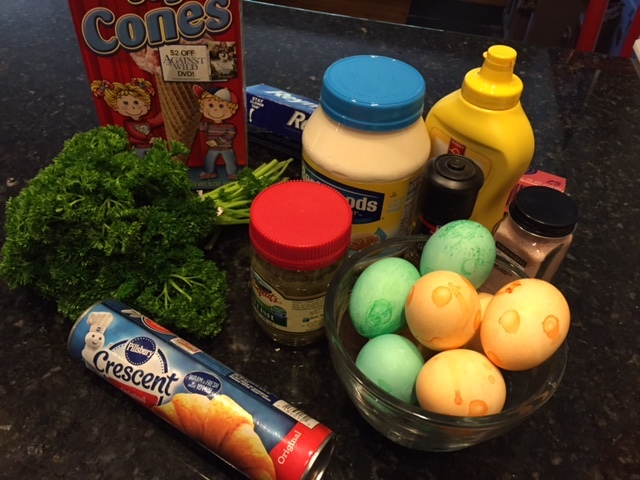 These are the ingredients we used: a box of sugar ice cream cones, foil, non-stick spray, parsley, crescent rolls, hard boiled eggs, mayonnaise, mustard, pickle relish, salt and pepper, and orange food color. Make your salad first, my mom said she doesn’t have a recipe for her egg salad, she just uses as many eggs as she thinks she needs and add the mayo, mustard, relish, salt and pepper to taste. She likes to add onions, but I don’t like onions in my egg salad so she didn’t add them. Once your salad is chilling in the fridge, tear off two 12X12 inch pieces of foil. Cut each piece diagonally to make 8 triangles. Wrap 8 sugar cones in the foil and spray them lightly with non-stick spray. My mom didn’t do this and that is how she knows you need to do it! When you have all your cones wrapped and sprayed, preheat the oven to 375 and line a baking sheet with parchment paper. The next step is to open the crescent rolls and cut each one into 3 pieces. Be sure when you start to roll them on to the cones, you seal the bottom. My mom said you do not need to make sure the dough is touching and overlapping as when the crescents bake, they will fill in the gaps, just don’t leave the gaps too big. My mom made them all touch and the carrots were fatter with less room to fill them up, they were still good though! 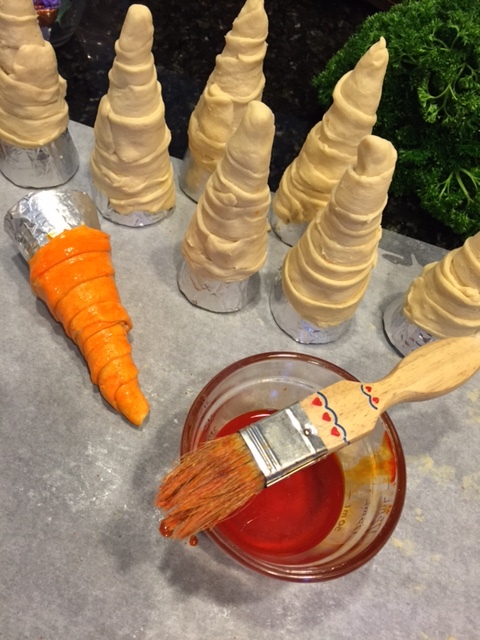 Add a little bit of orange food color to water and using a pastry brush to color the cones orange. You don’t have to do this, but if you are already going to this much trouble for fun, make it all the way fun! Bake for 10-12 minutes, but make sure you drop the rack in your oven to the next to the lowest place or the tips of the carrots will get a little darker than they rest. Yep, that’s something else my mom figured out. 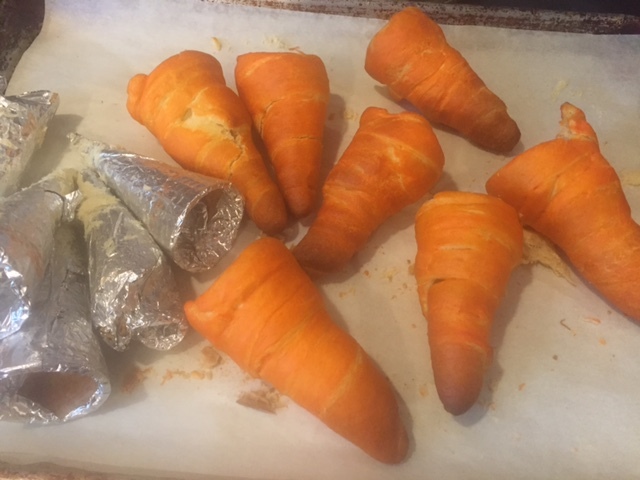 Since my mom did not spray her foil covered cones, she and i had to work carefully to get the crescent carrots off the cones. 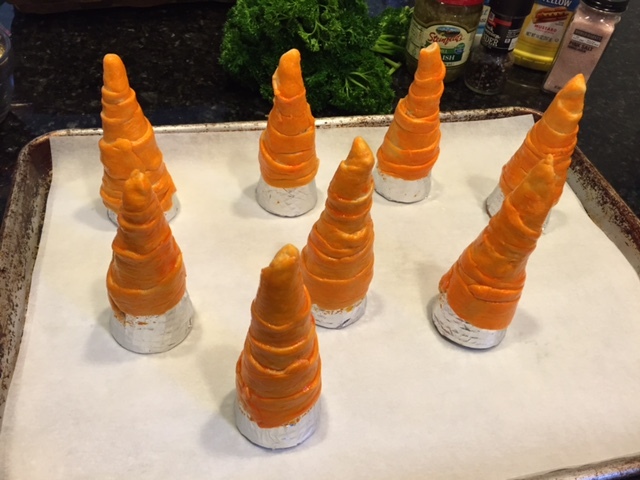 We broke a few, cones and crescent carrots – but they still tasted great! Let them cool just a little and then fill them with your egg salad. 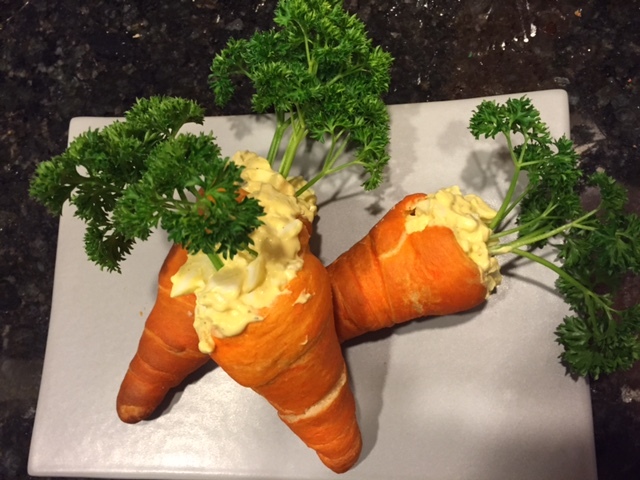 Once you fill the carrot crescent, add a few sprigs of parsley being sure to leave some stem on so the sandwiches really look like carrots! If you let the crescents cool all the way, be sure to put them in a plastic bag so they don’t get hard, or if they do get hard, fill them a little while before you are ready to eat so they soften up with the egg salad in them. These were really fun to eat and tasted so good! Thanks mom for making these for lunch, I can’t wait to make them myself.